Despite the widespread use of vessel sealing devices in laparoscopic colonic and abdominal surgery, there is little clinical data to support its safety or efficacy with any of the current manufactured devices .A prospective study was conducted using the Enseal Treo by Surg Rx for laparoscopic segmental and total colectomy to evaluate the safety of intracorporeal major pedicle ligation. 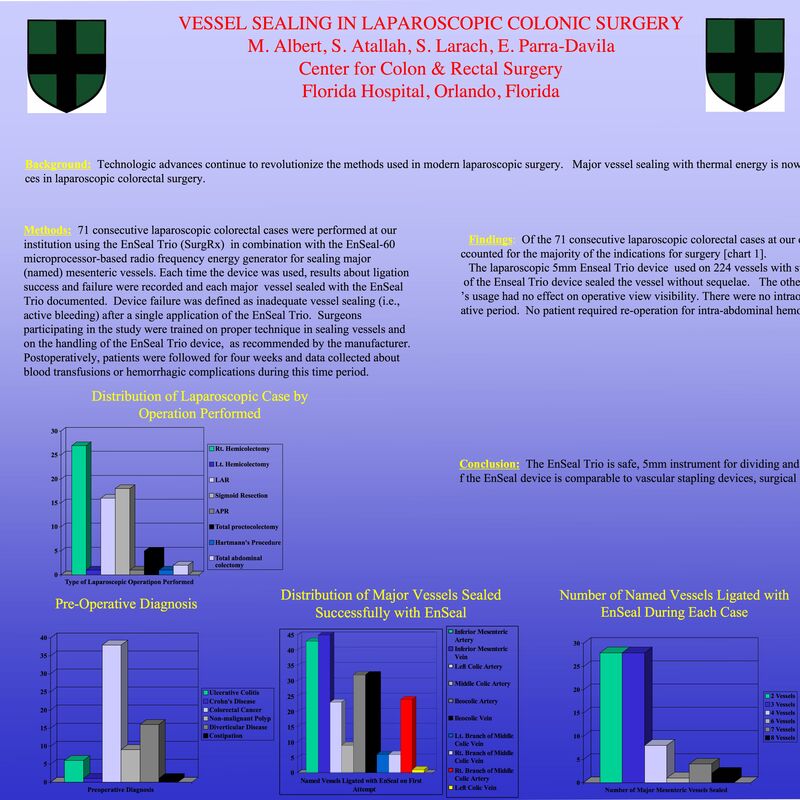 A total of 125 vessels were divided in 50 consecutive patients undergoing laparoscopic colectomy. Division of named vessels (ileocolic, inferior mesenteric, or middle colic) was documented and recorded digitally. No significant bleeding complications occurred in any of the patients. Three vessels with minimal oozing were successfully resealed. In 2 patients the inferior mesenterc artery had pulsatile bleeding controlled with 5 mm clips. Adequate major vessel ligation was accomplished 98% in 96% of the patients. Conclusions: The Enseal by Surg Rx, is safe and efficacious for major pedicle division in laparoscopic colonic surgery. Technical aspects are critical with minimal tension and slow division being the most important. After video analysis, failures seemed to be most likely secondary to poor technique or atherosclerotic vessels. Using proper surgical technique, in appropriately selected patients the enseal is safe with no adverse outcomes reported in our cohort of patients. A cost benefit also seemed to be demonstrated as there was no need for additional clip appliers or vascular staplers which led to fewer instrument exchanges and quicker operative time.